Srinagar, Aug 28 (KNS): Recently appointed office-bearers of Peoples Democratic Party (PDP) on Tuesday were accorded rousing welcome by the party leaders, activists and workers at the party’s head office here. Addressing the workers, party’s Vice President Abdul Rahman Veeri, General Secretary Ghulam Nabi Lone Hanjura and Noor Mohammad Sheikh stressed for the strengthening of the party and democratising its mission before the masses of the state. 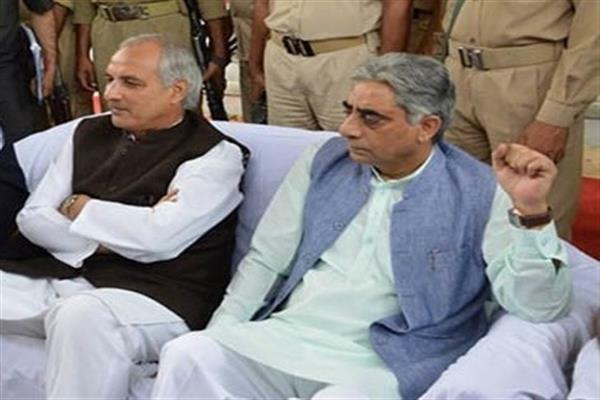 The nominees in their addresses ensured that the party will remain unanimous in defending the state’s special status and will foil any nefarious designs that could weaken the unique position state of Jammu and Kashmir enjoys at present. Vice President Abdul Rahman Veeri in his address termed the present situation worrisome as uncalled for assaults are being launched by the nefarious miscreants against 35-A.He added that a befitting reply shall be given to those rancorous elements who are out to vitiate the atmosphere of peace and tranquillity in the state and that they will find PDP an indefatigable defender of the state’s unique identity at every moment and on every pedestal. General Secretary Ghulam Nabi Lone Hanjura in his address asked the party cadres to remain confederate in pitching for the defence of Article 35-A so that no one is ever allowed to fiddle with JK’s special status. Party’s Srinagar President, Mohammad Khurshid Alam in his address while welcoming the recently appointed office bearers stated that the party cadres repose full trust in them and is confident that PDP will scan new horizons with eager hope of getting the state out of the uncertain and turbulent period. On Sunday, PDP president, Mehbooba Mufti revamped the organisational structure of the Party nominating Abdul Rehman Veeri as the Vice President of the Party while as Ghulam Nabi Lone Hanjura, Abdul Haq Khan, Mehboob Iqbal, S. Surinder Choudhary, F C Bhagat have been nominated as General Secretaries.